Last year, we shared Alex’s remarkable story. While on patrol in Afghanistan in 2012, he sustained multiple traumatic injuries and amputations after an explosion from an Improvised Explosive Device (IED). We followed his journey through the immediate recovery process in traditional medical fields, and his discovery of continued healing through horse-centered therapies. In 2017, Alex was seeing improvements in his ability to sit up for long periods of time by himself. This year, making amazing strides, Alex is now working on standing. Guided by Sheila Stahl Butler, his physical therapist at Forward Stride, his strength and balance are continually improving. Together they work on exercises utilizing the vaulting barrel, a device that gives a person the feeling of sitting on top of a round shape without using a real horse. Sheila uses this tool with much success to prepare clients like Alex for therapy on horseback. Alex has gained both core and upper body strength throughout the last year, not to mention stamina. He is practicing using his own strength to stand fluidly and sit back down, something he couldn’t do a year ago. 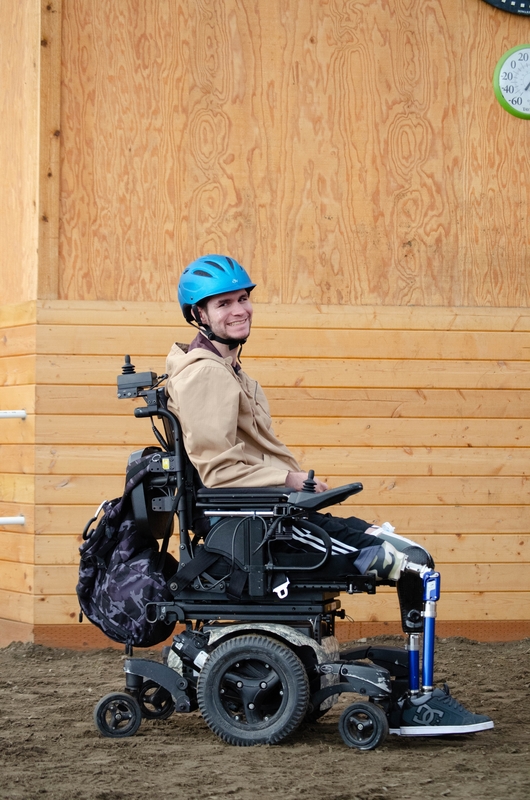 This allows for smoother and safer transfers from his wheelchair, improving life for both Alex and his caregivers, and giving Alex more independence and control over his life. Earlier this year, Alex and his wife Kim experienced the joy of moving into a brand new home specially adapted to fit Alex’s needs. If you recall from last year’s feature on Alex, the couple dreamed of one day owning a farm with horses and other animals. With five beautiful acres at their new property, they are closer to that possibility! Alex looks forward to coming to the barn every week, Kim says. 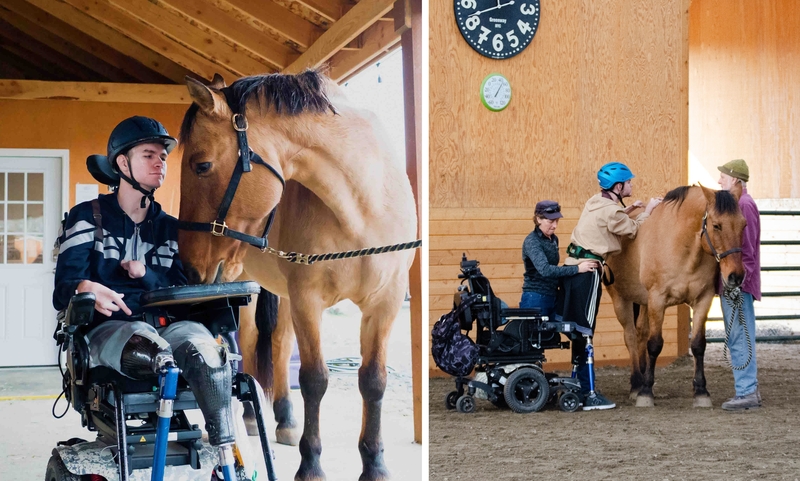 He loves being around the animals and working with them, and both Alex and Kim are seeing lasting changes in his quality of life. 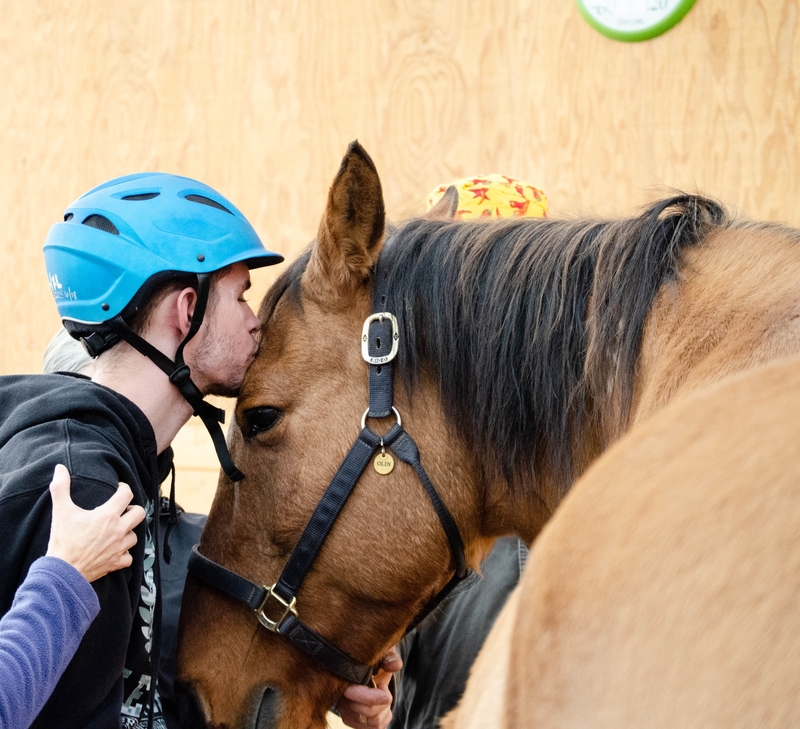 If you would like to help Alex and the rest of our incredible clients make lasting changes in their lives through horse-centered activities and therapies, please donate below!